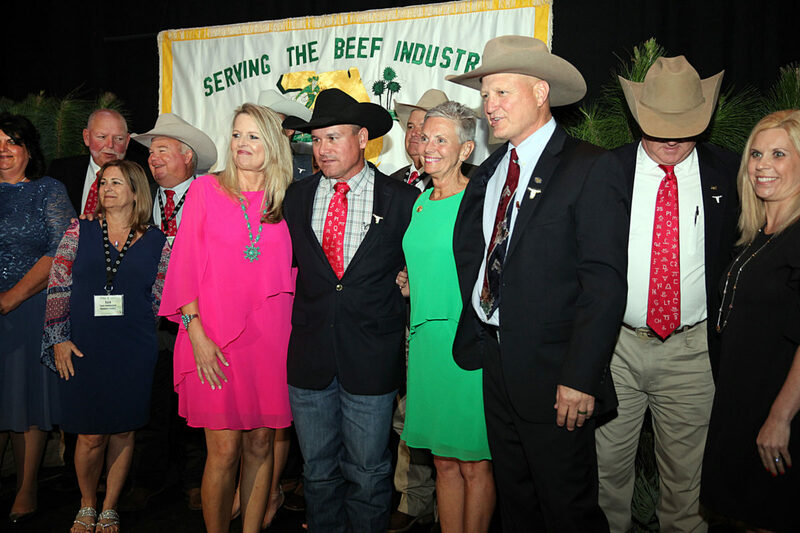 ORLANDO — A new chapter has been added to the Seminole Tribe’s storied history in the cattle industry. 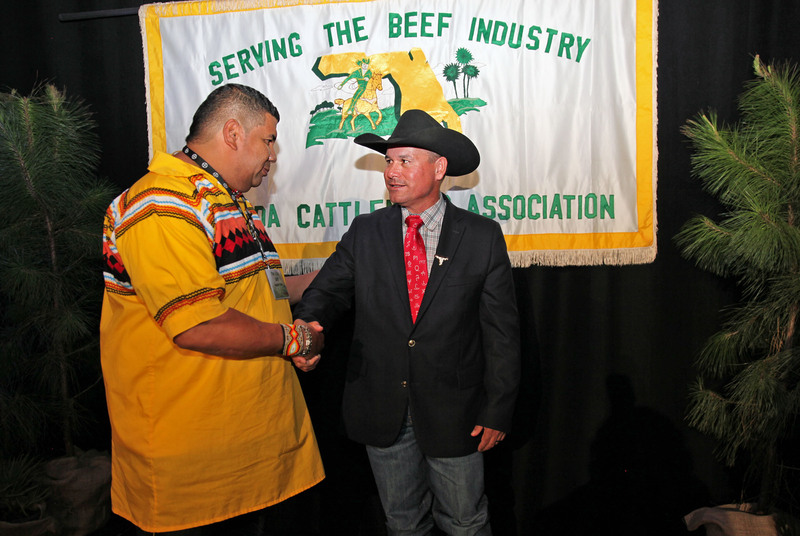 Tribal member Alex Johns was named president of the Florida Cattlemen’s Association at its annual convention June 21 in Orlando. Johns is the first Native American to lead the nearly 5,000-member organization. 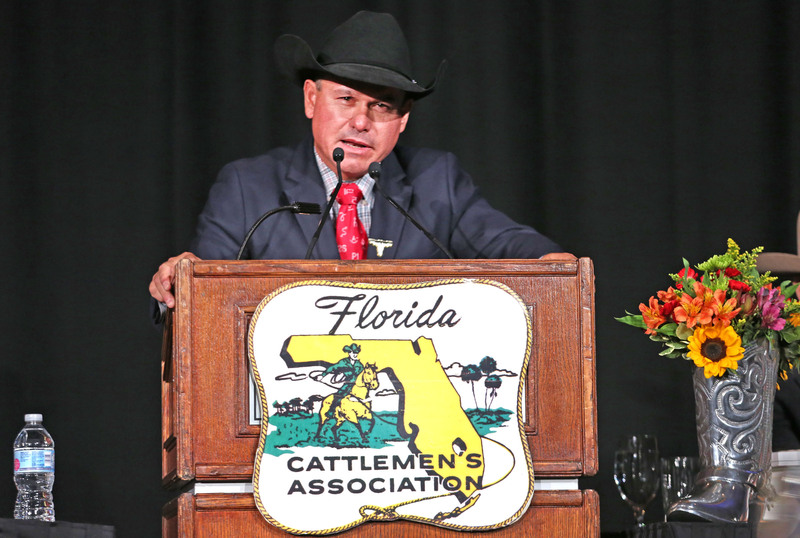 During his one year term of office, Johns, who also serves as the Tribe’s natural resources director, plans to promote the Florida cattle industry to create public awareness. The slogan is “Show Your Passion” and he wants every member of the FCA to embrace it. 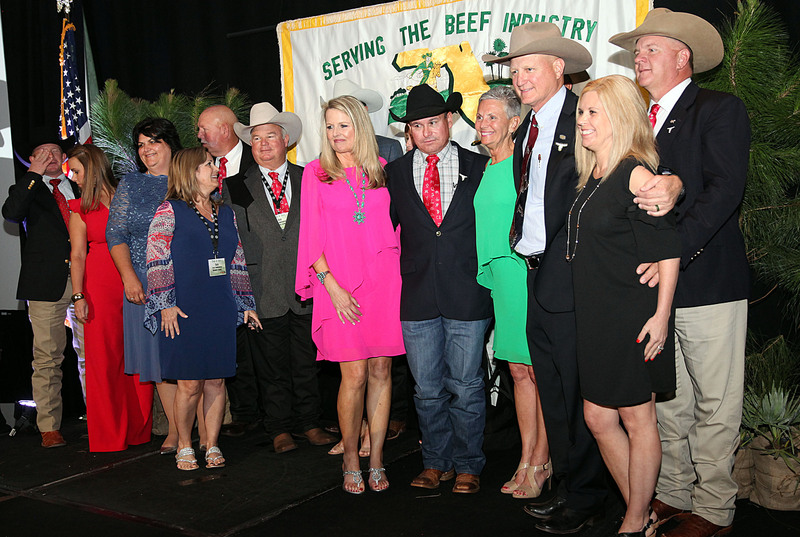 The announcement got the attention of the estimated 2,000 conventioneers and with enthusiastic applause, they welcomed their new president. 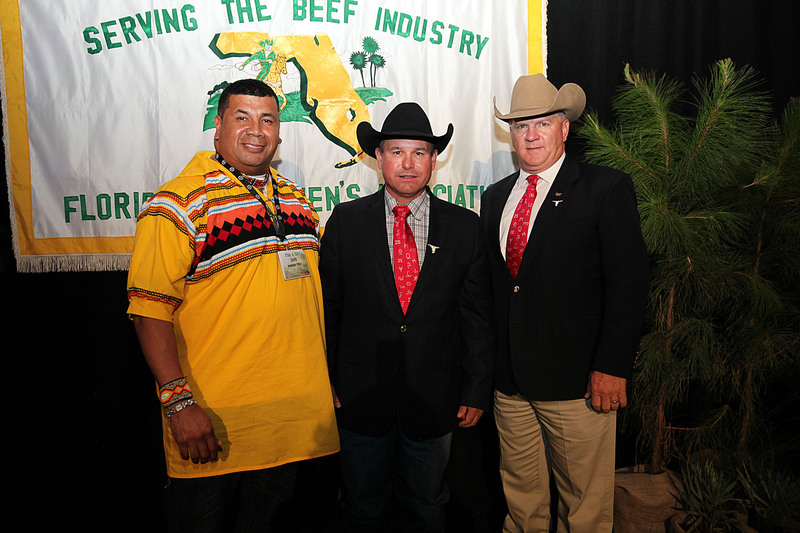 Seminole Tribal Board members Larry Howard, Joe Frank and Gordon Wareham attended the convention’s banquet. The Florida cattle industry began in the 1500s when Spanish explorers brought the animals across the Atlantic. 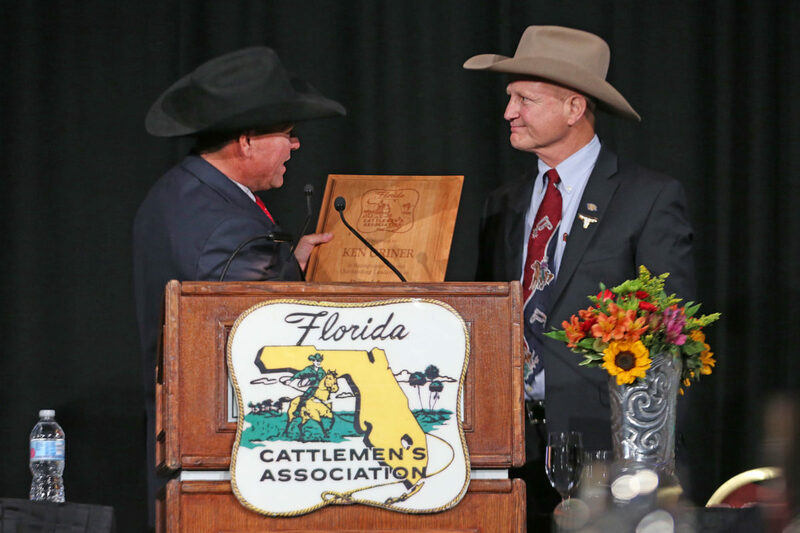 Native Americans’ involvement can be traced to 1740s and the Seminole leader Cowkeeper’s massive herds in northern Florida. 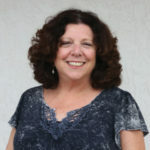 By 1775, the Seminoles worked 7,000 to 10,000 head on Paynes Prairie near Gainesville and were cattle keepers until the Seminole Wars and Civil War decimated the Tribe and its herds. It wasn’t until the 1930s, after the Tribe was living on reservations, that cattle were introduced again in the form of about 400 malnourished animals. 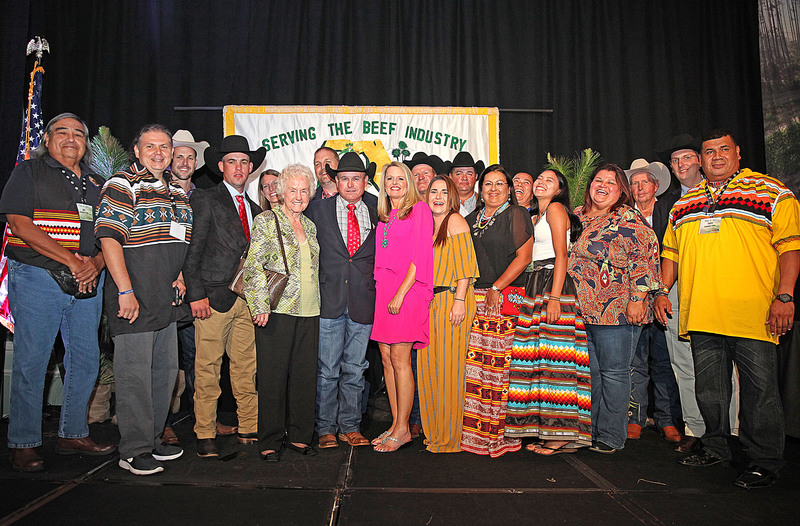 With time, the Tribe’s cattle operation grew and by the 1990s it had become an industry leader. Today the Tribe’s program is one of the top in the nation. 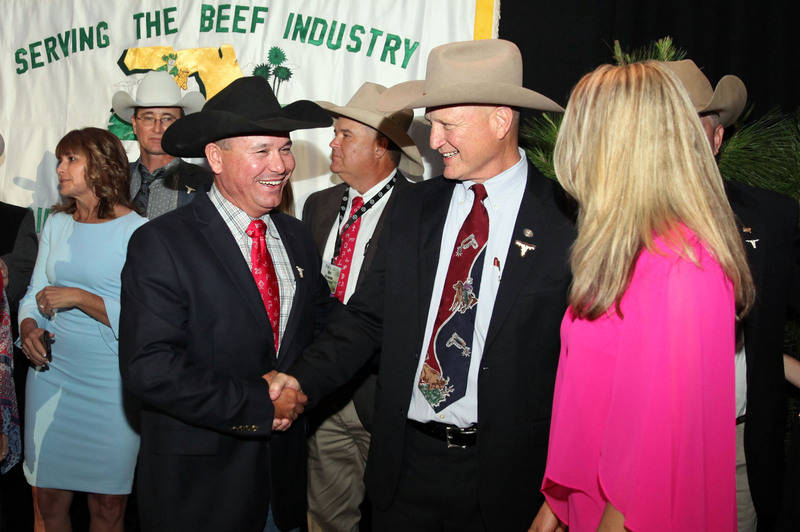 In his role as natural resources director, Johns has overseen and guided the Tribe’s cattle program. 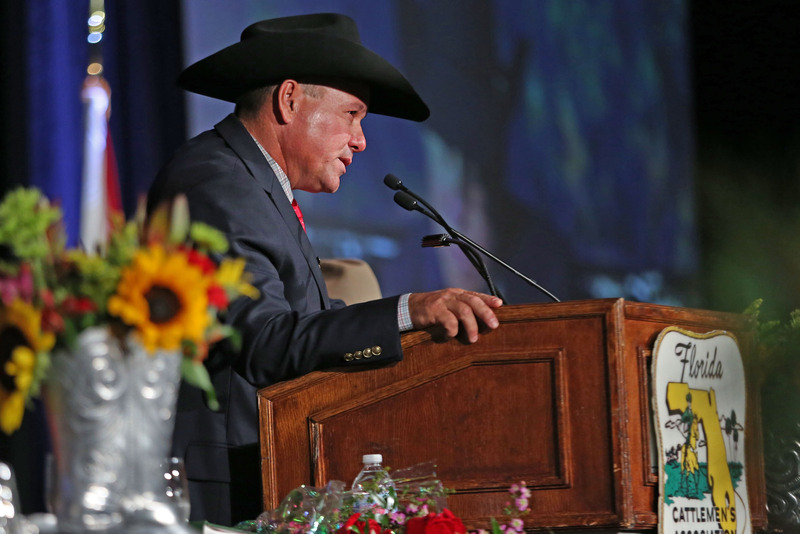 In 2013 he urged the board to purchase Salacoa Valley Farms in Fairmount, Georgia, a successful seed stock operation. 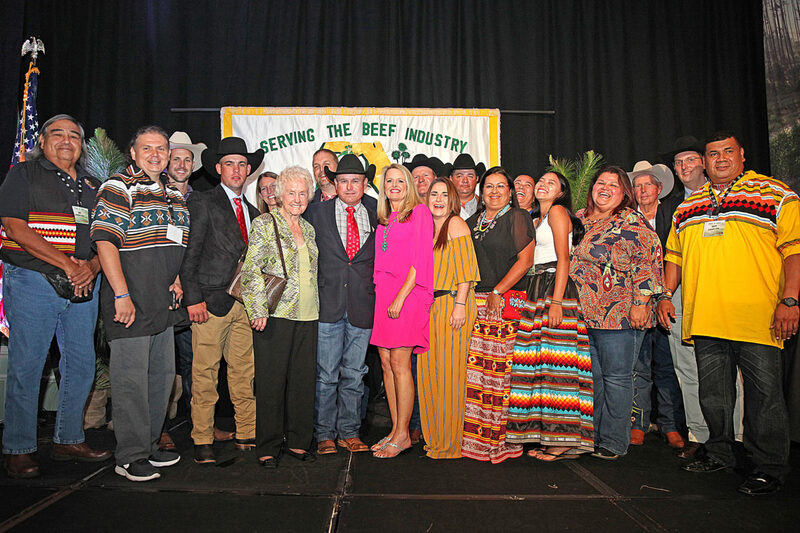 Johns knew that superior genetics would lead to a better beef product and he believes the Salacoa purchase has improved the quality of Seminole Beef produced by the Tribal herd. 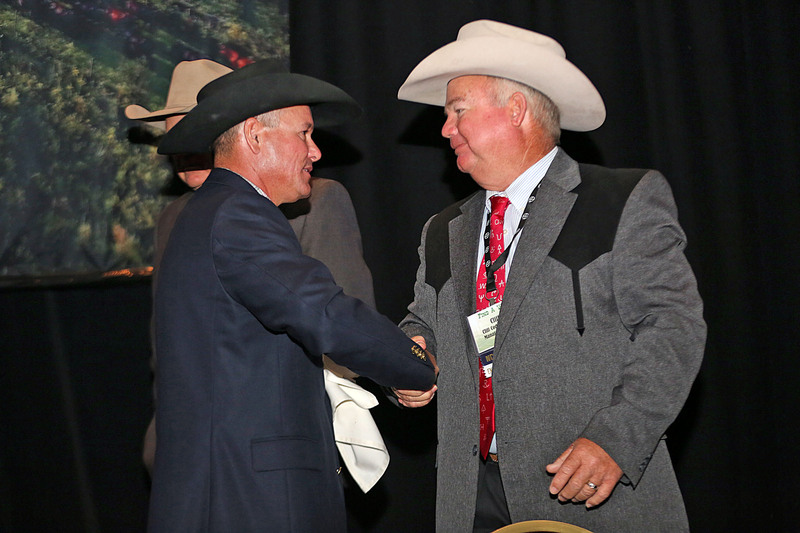 For more than a dozen years, Johns has served in various leadership positions in the FCA. The nonprofit organization’s membership, comprised of cattle producers and affiliates statewide, represents 900,000 to a million cows in the state and accounts for about $700 million in calf sales annually. 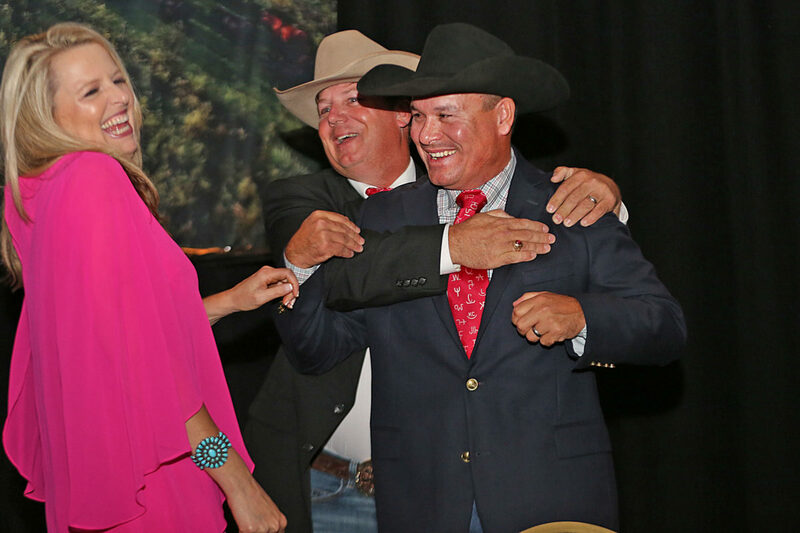 The process of taking the FCA helm began for Johns with committee, county and district leadership positions. The path to the presidency was a six year process in which he served as secretary, treasurer, second vice president, first vice president and president elect. The process ensures the work that is started, which often takes years to be completed, is understood by everyone in leadership roles. 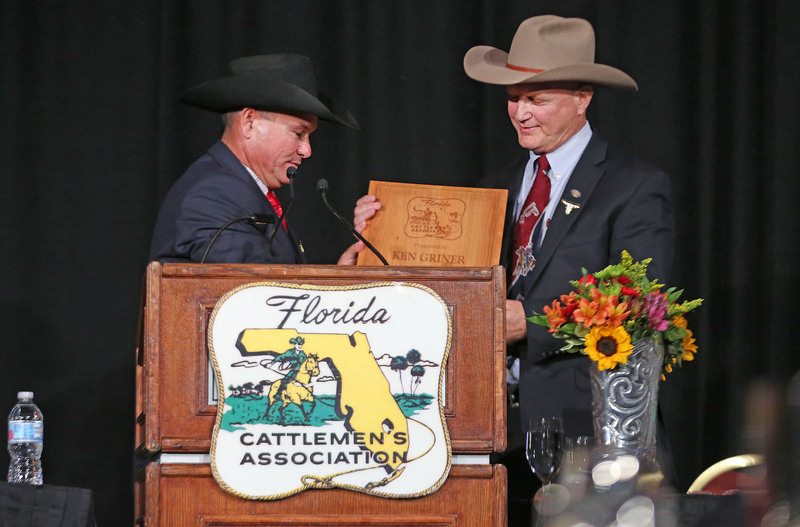 According to its website, the FCA is “devoted entirely and exclusively to promoting and protecting the ability of cattlemen members to produce and market their products.” To meet that goal, the organization’s leaders represent the membership to lawmakers in Tallahassee and Washington D.C. FCA is a grassroots and inclusive organization. 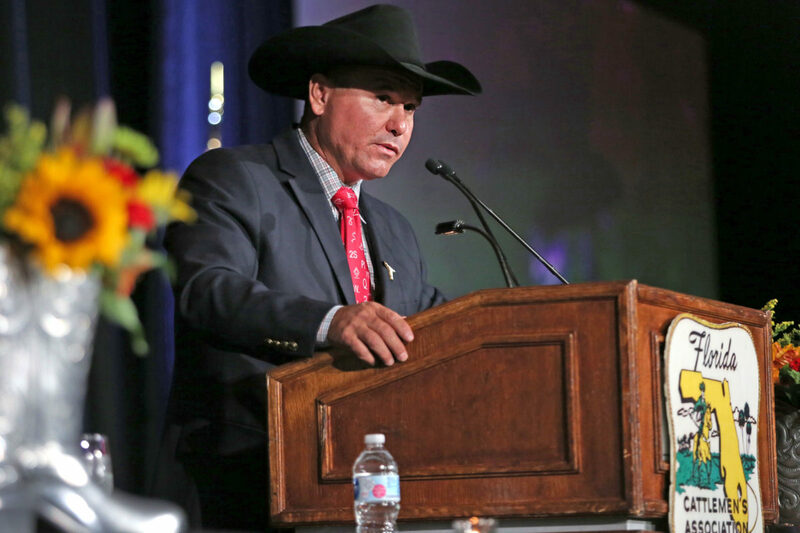 “It doesn’t matter if you have 10 cows or 10,000, you have the same voice,” Griner said. Griner believes one of the biggest challenges facing Johns as president will be time management. Since Florida is such a large state, making all the FCA meetings and going to Tallahassee and D.C. to address legislative issues is time consuming. “It’s a lot of windshield time,” he said. Prior to the banquet, at which he would take over the responsibilities of president, Johns socialized with FCA members at the President’s Reception. 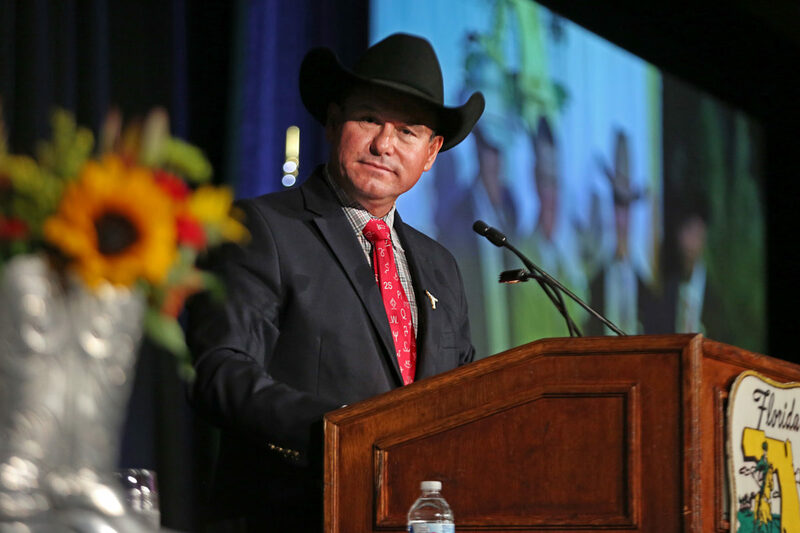 Although he claimed to be a bit nervous about the evening, he confidently greeted other cattlemen and cattlewomen in the crowded room. 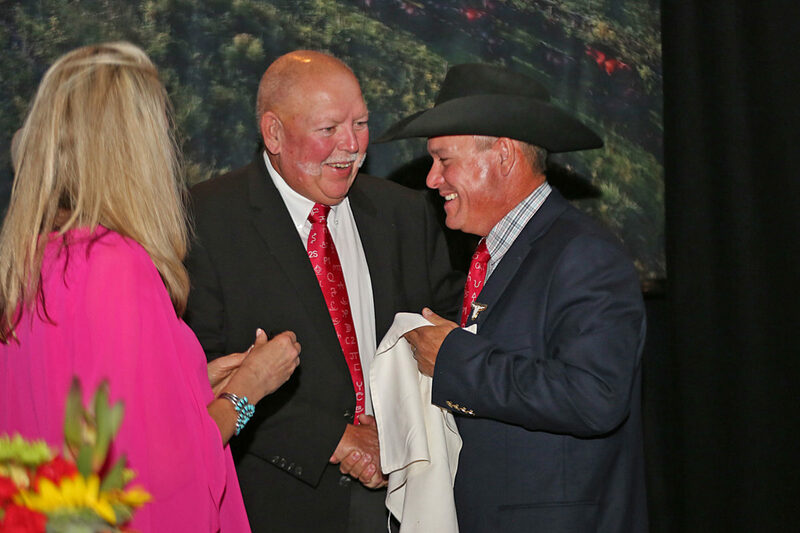 Bobby Yates, natural resources cattle foreman, has worked for Johns for years. Outside of the reception, a few long-time FCA members sat comfortably together. All were impressed with Johns and were looking forward to having him lead the organization. “He’s an exceptional young man and has a lot of ability,” added Billy Kempler, 72, of Brevard County. Johns plans to continue to work on issues the FCA has been addressing already, one of which is animal disease traceability. Since the FCA members produce food, the leadership believes they have a responsibility for it. If a problem arises, traceability will keep the problem local and make it easier to fix, rather than having to shut down the entire industry. Public grazing is another important issue for the FCA, whose members help the state manage the land and make it productive through land leases. Many ranchers lease land since it can be difficult to own the vast amount necessary to raise cattle. 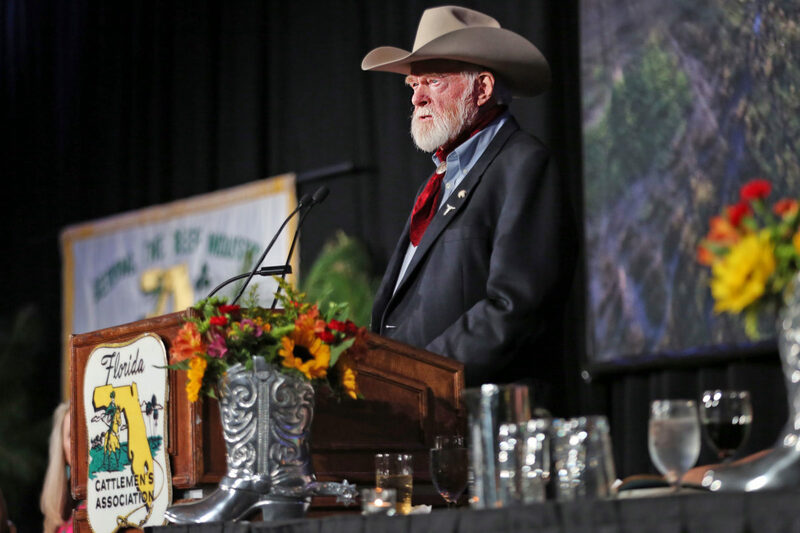 The banquet featured awards, acknowledgements and guest speaker Red Steagall, who entertained the crowd with a litany of stories and original songs. 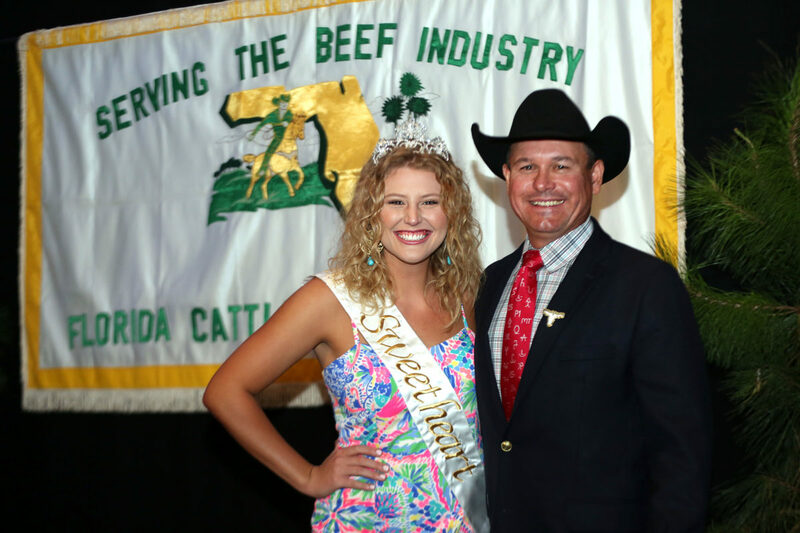 Pearce believes it’s fitting that a member of the Tribe, as one of the first in the state to have cattle, will lead the FCA. 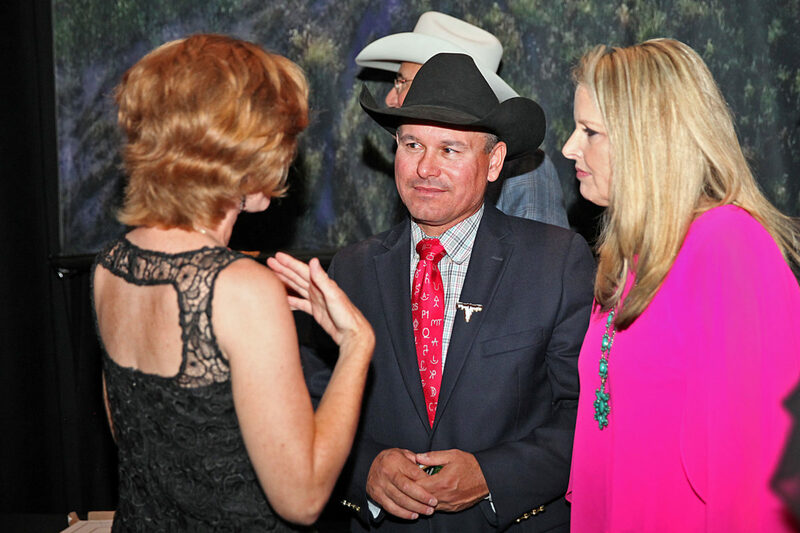 Griner said the best part of the job when he served as president was interacting with members, seeing parts of the state he normally wouldn’t have had time for, being exposed to different ways of doing things and different opinions. He has no doubt that Johns will rise to the task.